This green tea with a wavy, light green leaf has a fresh, strong character. 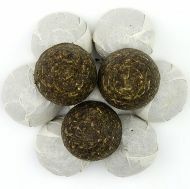 This organic tea is characterized by its slightly tangy and refreshing flavour. It has a rolled leaf and is produced in the Wuyan area in the Jiangxi province. This tea resembles the Chun Mee tea but – due to careful selection and processing – has a more beautiful and smaller leaf with a subtler flavour. 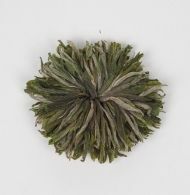 The jade green "Spiral of Spring" is a very elegant, handpicked and carefully processed green tea with an abundance of white tips and a delicately twisted leaf. A great delight with its lively freshness, a hint of sweetness and the clear, light cup. An organic Sencha from the southeastern Chinese province of Zhejiang. It is characterized by a pressed leaf and a pleasantly grassy note with a yellow-green cup. It is an old tradition in China to press tea into bricks or nests for better storage life. This green tea from the Yunnan region has a soft body and a subtly smoky note. Infuse one tea nest with about 500 ml of water that is not boiling hot anymore and let brew for about 2 min. This tea can be infused several times. Weight per unit about 4 g.
China Special Green Tea Mu Dan Tea Rose 1pcs. This leaf tea comes from the south of Anhui, a region located in the northern part of China. Only the bud and the finest leaves are processed for this specialty. "Mu Dan" means "peony", a flower which in China stands for wealth and success. Not least because of this, Mu Dan is very popular in China and is also called the "Queen of Flowers". Freshly plucked leaf tips are made up to a rosette by hand, pressed flat and dried. After the brewing it unfolds to a grass green tea rose and gives us pleasure with its fine-fresh note and its very sweet taste also after multiple brewing. This coarse and voluminous tea is naturally low in caffeine and has a slightly astringent and pleasant flavour.